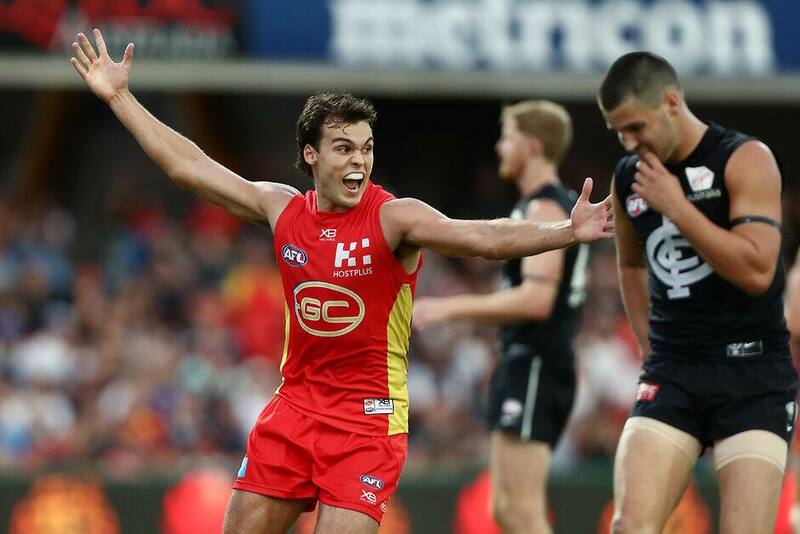 A Jack Bowes snapped goal in the dying seconds of the match has secured a remarkable two-point win for Gold Coast over Carlton at Metricon Stadium on Sunday afternoon. Carlton looked like it had broken through for its first win of the season when star midfielder Patrick Cripps goaled late in the last quarter to put the Blues ahead by five points. But the SUNS battled their way into the forward line in the last minute of the game, with Bowes pouncing on a loose ball to snap the match-winning goal on his left foot, sealing the 8.11 (59) to 8.9 (57) victory. Bowes match-winner saved the SUNS from embarrassment after a butchered opportunity to almost seal the match minutes earlier. Up by one point with about seven minutes left on the clock, Alex Sexton kicked a long bomb that appeared to be on its way through for a goal. Gold Coast forward Peter Wright was free in the goal square and tried to mark the ball, but he only managed to fumble it through for a point. Carlton punished the SUNS for the error, transitioning the ball from the kick-in all the way into the forward 50, where Cripps scored a goal from a set shot from about 20m out. For the Blues, midfielder Sam Walsh continued to show why he was last year's No.1 draft pick, with stepping up to record 28 disposals, six marks and six tackles. Walsh played with a confidence beyond his 18 years to complement Carlton's more experienced midfield stars Cripps (30 disposals) and Marc Murphy (29 disposals, 15 marks). Jacob Weitering and Liam Jones were rocks in the Carlton defence, rebounding the ball repeatedly for the Blues. Touk Miller was a standout for Gold Coast, jumping out of the blocks to register a team-record nine tackles in the first quarter, and he continued to be a strong presence around the ball, finishing with a match-high 31 disposals and 14 tackles, but was let down by some poor kicks in the last quarter. Co-captain David Swallow was also strong in the Suns midfield, influential with his 30 disposals, while defender Sam Collins continued his good form. Up forward, Nick Holman scored two important second half goals. Blue Will Setterfield will come under scrutiny from the Match Review Officer after a second-quarter tackle that concussed SUN Wil Powell. Powell's head slammed into the Metricon Stadium turf in the tackle. The young SUN tried to stand but staggered backwards and fell over before trainers took him off the field for the rest of the game. Gold Coast is now 3-1 for the season, with all four matches decided by less than a goal – a one-point loss to St Kilda, a three-point win over Fremantle, a five-point win over the Western Bulldogs and today's two-point victory. Gold Coast: Defender Jack Hombsch came off in the first quarter with an elbow injury but was able to resume after some attention on the bench. Wil Powell came off the field in the second quarter with concussion following a strong Will Setterfield tackle. Carlton: A ginger-looking Mitch McGovern came off in the fourth quarter but returned to the field. Gold Coast will face Adelaide away next Sunday afternoon. Carlton will still be searching for its first win against the Western Bulldogs at Marvel Stadium on Sunday.